Athens, Ga. – Researchers in the University of Georgia's Regenerative Bioscience Center have succeeded in reproducing the effects of traumatic brain injury and stimulating recovery in neuron cells grown in a petri dish. This makes them the first known scientific team in the country to do so using stem cell-derived neurons. The procedure, detailed in a new paper in Nature Scientific Reports, has significant implications for the study and treatment of such injuries. Unlike other cells in the body, most neurons in the central nervous system cannot repair or renew themselves. Using an agent called glutamate that is released in high amounts in the brain after traumatic injury, the research team recorded a concussion-like disruption of neural activity in a dish containing dozens of minute electrodes. Through these recordings, they then evaluated the activity and influenced recovery by electrical stimulation. "Once the neurons reach a certain level of density in the dish, you begin to see what we call synchronous activity in a very timed manner," said lead author Lohitash Karumbaiah, assistant professor in University of Georgia's College of Agricultural and Environmental Sciences Department of Animal Dairy Science. "Knowing we could re-create synchronized, brain-like activity in a dish gave us the impetus to ask, 'What if we disrupt this rhythm, and how can we recover from something like that?' "
In 2015, the U.S. Food and Drug Administration approved the first deep-brain stimulation device–an electrical stimulation cap that patients wear continuously–for treatment of Parkinson's disease. 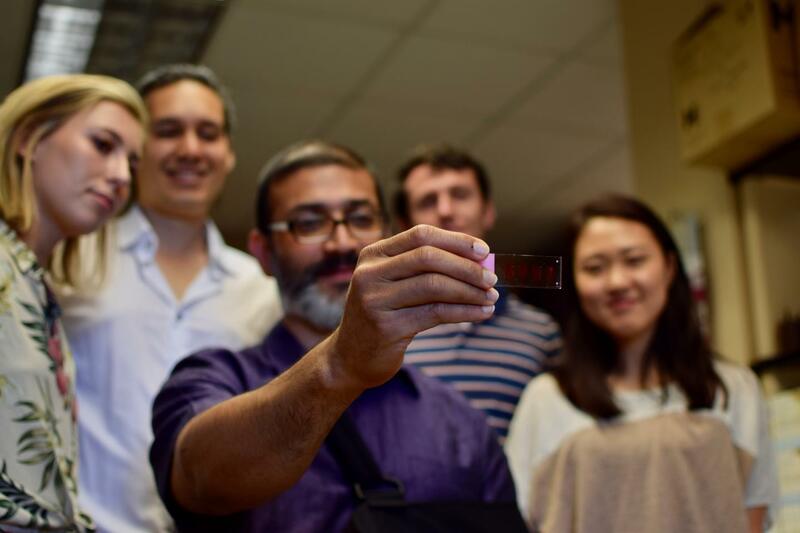 Karumbaiah and his team hope that electrical stimulation could be a clinically translatable approach for recovery from traumatic brain injury, or TBI. The next step, he said, is to connect with external collaborators to tailor electrical stimulation approaches with biomaterials that can exploit neuroplasticity. Such treatments could be highly beneficial, for example, to veterans. Many veterans suffer from TBIs incurred through shock waves from explosions, with no physical focal point of injury. "Drilling into the brain randomly to access tissue in such cases makes no sense," said Karumbaiah. "A wearable device that can administer fairly controlled levels of relevant electrical stimulation can help these patients." One of Karumbaiah's co-authors is Maysam Ghovanloo, professor of electrical and computer engineering at the Georgia Institute of Technology. Ghovanloo has led development of the Tongue Drive System, which allows individuals with spinal cord injuries to control their wheelchair or digital devices by moving their tongue. He has also developed technologies for neural interfacing and implantable medical devices. Ghovanloo will put his expertise in medical instrumentation to work in developing devices for the team's pre-clinical studies. "We have developed a unique approach for observing and guiding stimulatory patterns in the brain at multiple levels, all the way from individual neurons to the neural tissue, and eventually the entire brain," Ghovanloo said. "All while taking into account the animal behavior to opportunistically apply stimulation when they are most effective." According to Karumbaiah and Ghovanloo, electrical stimulation devices, whether designed for implantation or wearable use, must be small and power-efficient. They believe their approach will be clinically practical because smart design and application of stimulatory regimens can significantly reduce power consumption. " "Because we've been recording from these neurons for a long time, we know what the magnitude of the pulses or activities of these neurons are," said Charles-Francois Latchoumane, a postdoctoral researcher in Karumbaiah's lab. "Now we can mimic those routines by programming them externally and feeding it back into the brain."